The figures below show an example of the aggressive brow-bone reconstruction work often done by Dr. Ousterhout as just one part of the overall Facial Feminization Surgery (FFS) on transsexual patients. 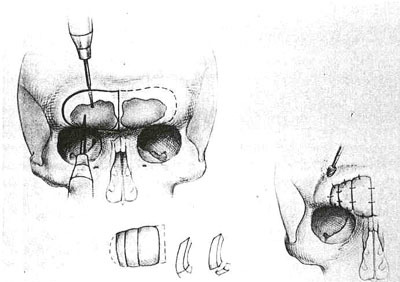 These figures [from Aesthetic Contouring of the Craniofacial Skeleton, Douglas K. Ousterhout, Ed., 1991] show how a large section of forehead anterior to the sinuses can be removed, sectioned, recontoured and then wired back in place to feminize the forehead and browridge. This is the "Forehead III" procedure, which Dr. Ousterhout performs on patients who have prominent browridges not thick enough in front of the sinuses to allow reduction by grinding alone. Adequate grinding in such cases would make the forehead too thin in front of the sinuses. Lynn required this Forehead III procedure, and the result dramatically feminized her profile. Some patients brow/forehead reductions can be fully and more easily done using the "Forehead II" procedure, in which the contouring can be accomplished via grinding followed by some filling-in with a surgical "bondo" called methyl methacrylate to eliminate any adjacent concave regions. Other cases ("Forehead I" cases) can be fully accomplished even more easily using grinding alone. The FFS operation time is affected by the type of forehead surgery required for the patient. Surgical costs are lower for type I and II vs type III. The decision on which procedure to use (and many others) is made during the earlier examination of the patient's facial X-rays. Cutting out the anterior wall of the frontal sinuses, sectioning into pieces, and wiring them in place after sinus margins (right) have been contoured. 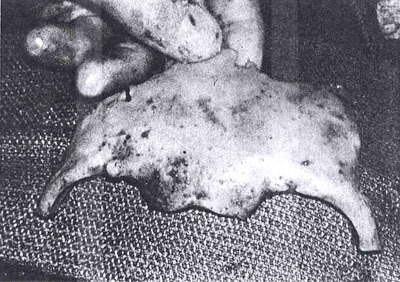 Anterior wall of frontal sinus after being removed and prior to being sectioned into pieces and recontoured.